I had a lovely evening last night. Today I feel deflated, even tearful. Yesterday I was in a state of elation. Today I have crashed. What is wrong with me? It’s to do with feeling criticised, feeling like a heavy leaden lump of fifty something has -been-ness. Isn’t it silly that I was secretly pleased that Graham started urging me to have a cancer check up. Dreams last night were odd. I was dropped off on a part of Jhb that I don’t know, went down a road looking for something familiar and realised I had done what I always advise others not to do. Just one road down from a main road and it was dark, dim and a little worrying. I felt apprehensive. A boy approached me, or did he come from behind? Almost both. I asked for directions and then he said he would show me, he sensed my nervousness and became a little threatening, took a magazine I was holding. I was sure he was going to try and rob me, then we got to a shop on the corner and I went inside and somehow shook him off. Then I landed up in the middle of braamfontein. I wanted to get a bus, they kept going past, those red Jhb double decker buses but none of the numbers and names looked familiar. I had this idea of going to my parents who lived in a high rise block of flats that used to be near the old drive in roadhouse. The other option was Julia’s place but I knew I would have to sleep in her bed and didn’t want to do that. This got all confused, suddenly the boys were there, they were tall but not grown up and a little out of hand. I couldn’t remember the street names but knew exactly where I wanted to go. No-one could tell me the right bus. There was a guy in a combo type taxi, I asked if he could take us, I finally remembered Ponte and said it was near there. I then had to pay with my credit card which was declined but I knew I had paid, I had sent them a cheque a week before. The woman managed to sort it out. Next thing I was driving this combi which was difficult, I battled to control it, the clutch was awkward, the brakes took late and I kept feeling as if the car was going faster than I wanted it to but I couldn’t slow it down. I had to manoeuvre it through a narrow space and there was a big maxhine on the way. Men were around it, they moved it a bit and i got past somehow. Then we lost Michael. Then I was trying to phone my parents. I could near my dad talking as if the phone was off the hook and he didn’t know I was trying to talk to him. I kept shouting hello. He was talking about cricket and Lambie has come into bat and I thought oh no we must have already lost a lot of wickets. Finally he heard me and we spoke. There was another part to do with Forsdicks and having to go to Jhb with them, something where their helper (who seemed to be someone like Sandy Naidoo) said Julia had pooed in her pants and she wanted me to clean it up. I went to the room and found it wasn’t Julia but Chloe so she had to do it after all. I was pleased about this. These dreams stir me up, fuel anxiety. Especially the car dreams. I have so many dreams where I am in a car, driving it and it seems out of control. I had another one recently where I was driving on a windy road and thought I was driving slowly enough. 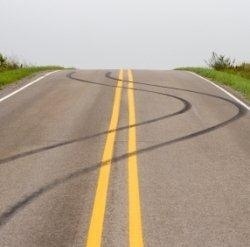 I went round a bend and lost control of the car, it spun round and round without turning over. There were runners on the side of the road and I could have killed them. They all glared at me. I felt helpless and had no idea why the car was not responding to me. I guess this is obvious, why I keep having these dreams. Especially the car dreams. Well, I should say, the purported cause of them is obvious but I still don’t understand.